Goa was on the cards when we planned it, but as the date of riding neared plan changed and changed a lot. I was a lonely rider on the NH 4, and wasn't sure about the place to stay on the first night of the ride. Goa isn't, like, much of fun for an introvert like me (yes introvert, else I would have been telling stories than writing ;), and so I was all ready to stay somewhere in a roadside motel en route on the first night. Night before the ride, I received a call from Vinni minutes after I posted about my ride on Bisons’ forum and twitter etc. He not only got me a room booked at Hubli with help of Mr Sanjay Hubli’s 99Cannons Bullet group but also advised to visit Gokarna especially Om Beach. 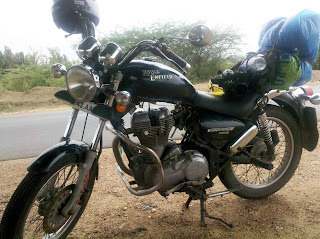 As it told (wrote) earlier, riding alone I was way ahead of time and reached Hubli well before sunset. So, I replanned the plan again and took a right turn (by actually turning left on NH 4 and then through an underpass) towards Gokarna. 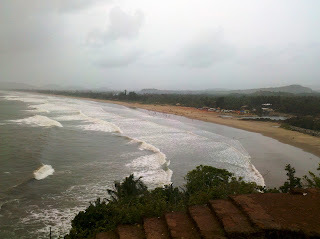 It’s not a very famous beach especially amongst Indian junta, and the fact makes it a perfect get-away destination. However, it’s certainly a famous religious town associated with Shiva and his great bhakta (devotee) Ravana, and so during month of Shravana (July-August) and on Maha Shivaratri one can expect meeting millions of religious-tourist on the beaches. 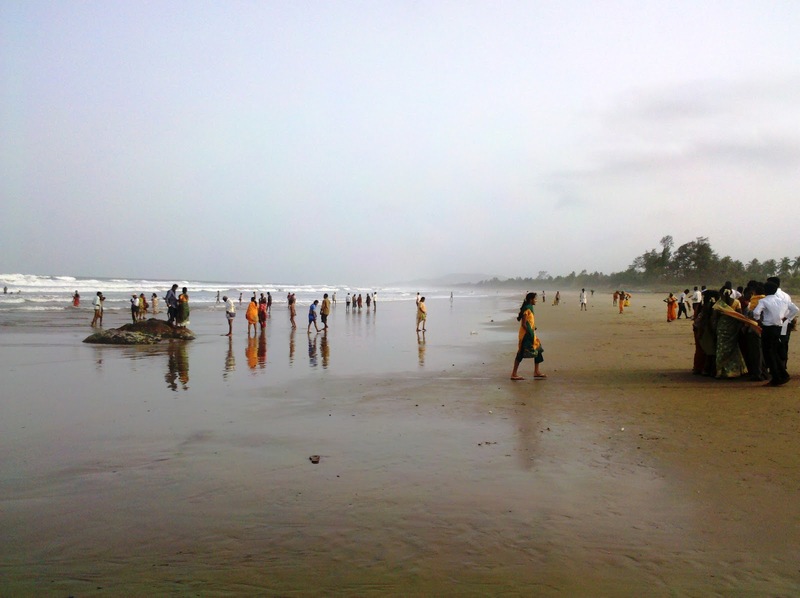 There are number of temples in this small town, and so are the beaches. I could only visit Hanuman’s birth temple and the Mahabaleshwar temple. 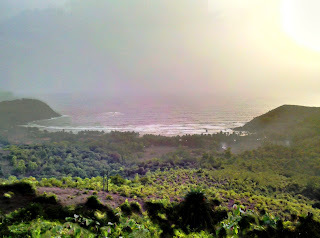 For the beaches, I visited Om Beach first, as advised by Vinni, but couldn’t get any place to stay. My wrong! 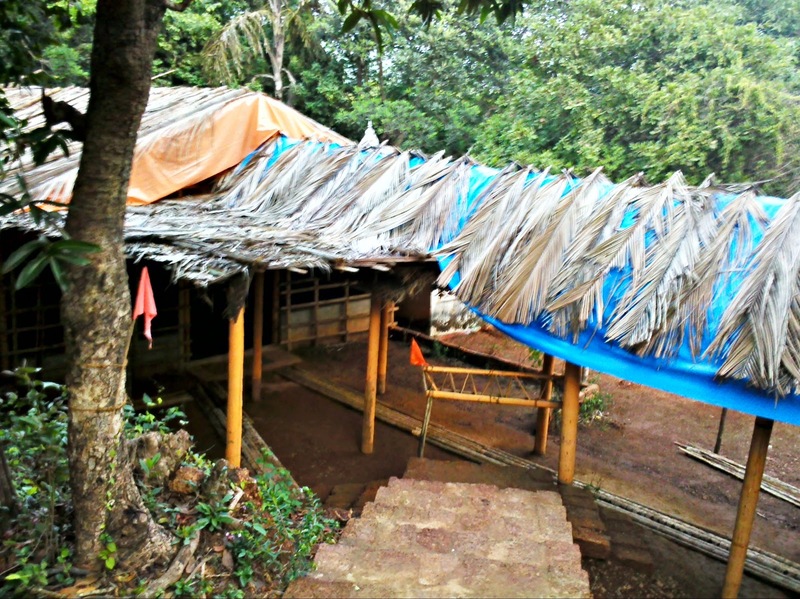 Namaste Café/ Resort in one good place to stay just before the Om Beach. It is also quite near to another serene beach- Kuddle. 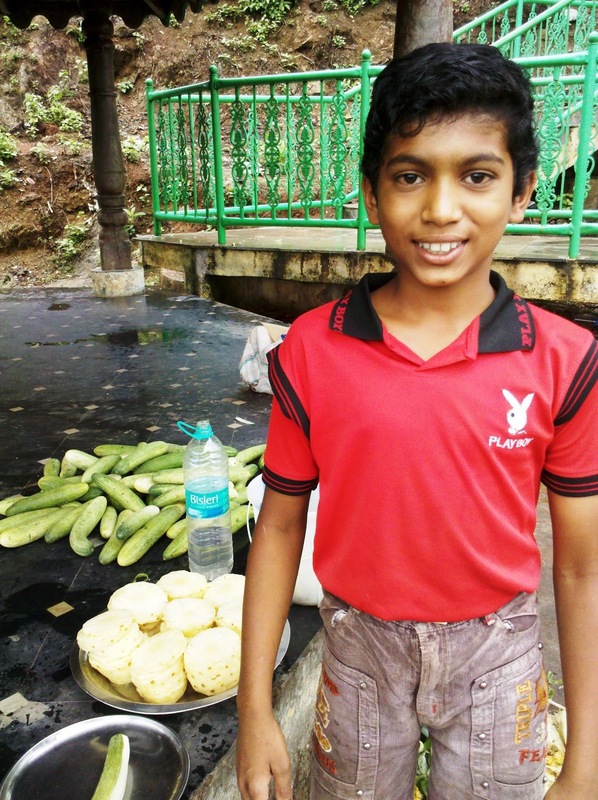 I could only get a place at Gokarna International, which is situated just at the centre of the town. Except that, there was no point to stay there if you can spend a little higher and are especially with a family or bunch of friends. 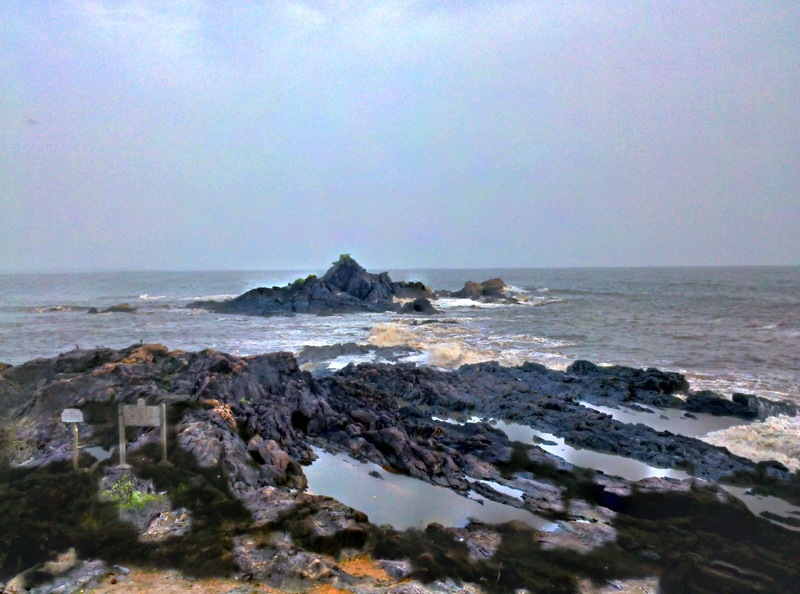 Still, I must appreciate that I got a good deal for the night and hospitality wasn’t that bad, otherwise I had a tiring and horrible experience of waiting for just checking into another hotel that’s situated before the Gokarna International (forgot the name!). Well, a night there, morning at beach, idli-tea-dosa as dinner and breakfast I left the town. Good was to meet another backpacker from Britain who was certainly astonished by the place as had not planned Goa but Gokarna in his India itinerary. Plan well, this place is awesome. If you stay in Karnataka, a day-trip would be good, but an overnight stay and time spent on beach would always be hell better. Book the resort, Hotels ain’t good. 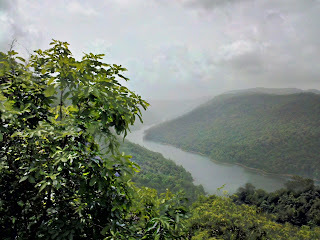 Monsoon, post-monsoon always the best time to visit! Next day’s destination was Jog. Jog or Jog Falls is the second highest waterfall of the country. Sharavathi River falling from a height of 253 m (830 ft) creates this magnificent waterfall. Nohkalikai Falls of Meghalaya is the highest Indian waterfall with a height of 335m. There are four distinct falls, distinct especially after a good monsoon season. 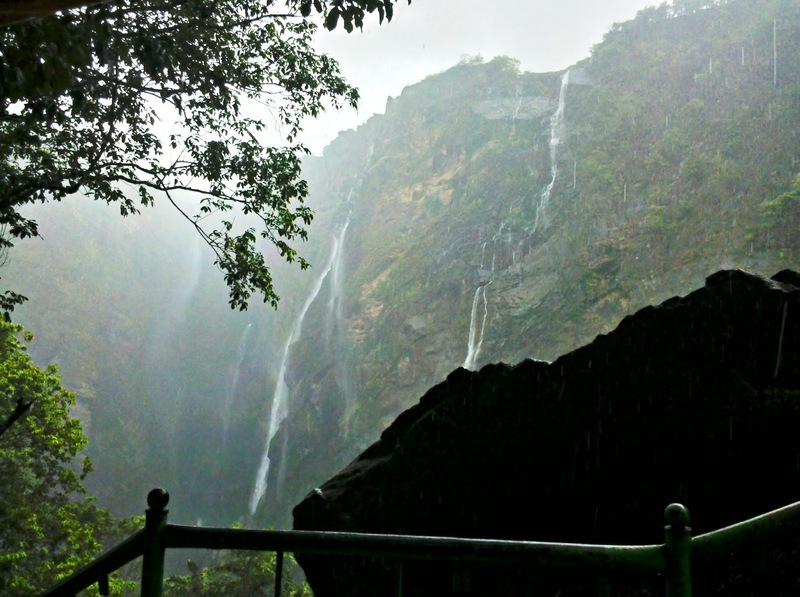 Raja Fall, as the name suggests, is the highest one with a height of 250 m. At about half way it meets the violent Roarer. Rocket, the third one, is characterised by jets of water while Rani is the charming calm one. About 1500 step leads one to the bottom of the fall. It takes about an hour to get down and double the time while ascending, OK! Tested! Verified! About the trip: I left Gokarna town at about 10 o’clock and got on to NH 17 (Mumbai-Goa Highway, now NH 66) towards Mangalore. I knew I had to take left after some 50km of ride. To be more confident about the route, I asked a person and he delightfully helped me, ‘Go straight, OneHour, Left’. Thick accent, but I could understand all except how he could be so precise about time. I asked another guy, and had same answer, ‘Go straight, OneHour, Left’. 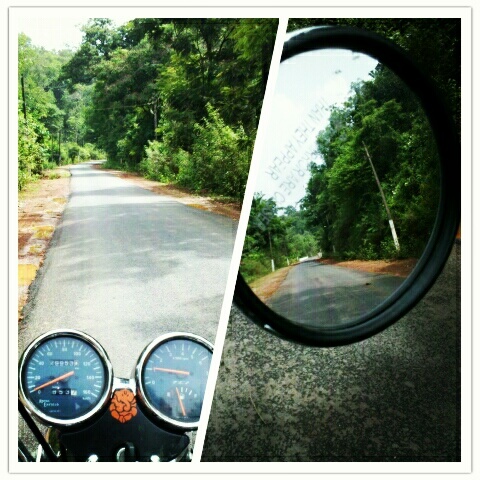 After about an hour’s ride I reached a place where I found a left sign towards Jog/Shimoga. I knew this is the place, especially when the town’s name caught my attention – “Honnaver’! Ohh! It wasn’t OneHour but Honnaver ;) Similar incidents happened many a times again when I lost in the traffic of Bangalore later in the evening. I reached Jog at about 12 o’clock riding another 60 kms. Parked Achtung near the viewpoint and planned to descend down the 1500 something steps. While going downstairs, whosoever I met was sweat-bathed and when asked about what time they took, replied in sign-language – a finger going down, two raising up i.e. an hour to reach bottom, twice to get back! Some 1000-1200 steps down; I decided not to go further. Monsoon was yet to arrive in full mood, so the falls were not that magnificent. But, at least I witnessed the Raja Fall, second highest in India! :) Weather was moist and rain was icing to the moist-cake! Inside my thick and heavy riding jacket I was literally sweating light a pig. Anyhow I managed to get back to the top and met Chandrashekhar, local kid, selling fresh cut pineapple and cucumber. Some time spent with him, clicking a few shots with my mobile cam, I left the place towards Shimoga/Bangalore. Visit Jog after a pretty monsoon, or else you would be disheartened. A group visit would double the fun, especially at the bottom of falls. 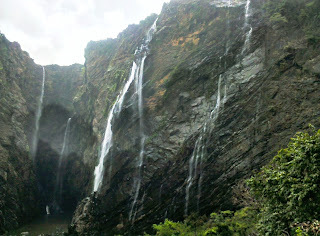 One may try to stay at Jog Falls. There are a few resorts nearby. 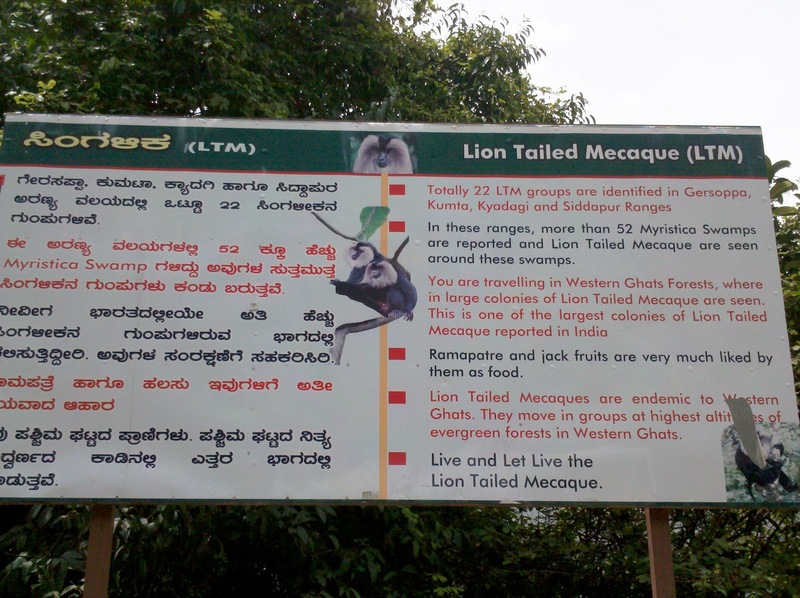 May plan for the trip inside the Jungles too, lucky one would be witnessing the Macaques, endemic to Western Ghats. Don’t just ride with the map, ask people. They are always savior. To my luck, I never met anybody who misguided me on any trip in any city. Be aware of Bangalore, it’s a huge city. If you curse Mumbai-traffic, Mann you need to see the other cities…. Had been to Hampi recently and was shown Hanuman's birth place there too! Strange!